The JazzN.ca |JazzNhouse idea arose in 2012, when Arnie Francis decided that bars, lounges and restaurants were places to drink and eat, not listen to jazz! He felt that great jazz artistry demanded an audience intent on listening. An intimate and relaxed house setting was perfect for a jazz concert. People sign up online, receive the address by email, bring sweets and savouries to share and their favourite beverages to enjoy, all at a fine and affordable evening out with old and new friends! JazzNhouse hosts are always gracious and welcoming, whether it’s 35, 40 or 50 people arriving! Guests are always respectful and responsible. The evening is always a treat! Live music is rarely about the style of music and more about the connection between players and audience, between the sound and the sensation. Without the barrier of a stage, or sports on the overhead TV, guests relax and are immersed in the joy of exceptional musicianship. 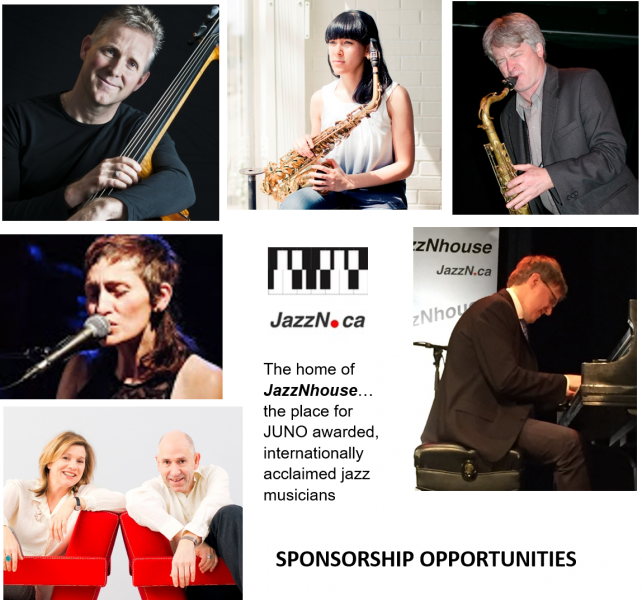 Now going into it’s seventh season in the Almonte and Carleton Place area, JazzNhouse continues to bring acclaimed Canadian musicianship to our community. Many of the artists are JUNO awarded, JUNO nominated or internationally acclaimed musicians. As a result JazzNhouse concerts sell out quickly – a testament to both the quality of the music as well as to the listenership of the audience. Check out our upcoming program at www.JazzN.ca. Question: Do YOU know of a well-loved home that would brighten up during an evening of jazz music and neighbours? Then contact Arnie: info@jazzN.ca. Let’s keep this community-sponsored, not-for-profit volunteer run adventure alive in our community!